This indicator tracks the location of large new office complexes according to whether they are accessible by public transit or only by personal vehicle. The location of major employment centers being developed today will be a key factor in our ability to steer land use patterns sustainably in the future. When a major development is built, new roads, homes, and shopping centers often follow. If the area is only accessible by car, the overall development pattern in the region will be car-dependent, leading to more clogged roads, wasted time, and air pollution. If new developments are transit accessible, however, the new developments that follow them may also be, contributing to revitalization of urban areas, more downtown businesses, and stronger urban areas. Unfortunately, the data underlying this indicator have not been updated since 1998. However the issue is sufficiently important that we are presenting the old data; updating this in the future is crucial to assess the impact of the recent emphasis on smart growth in New Jersey. 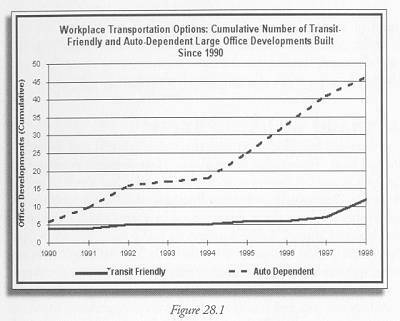 As Figure 28.1 shows, the increase of auto-dependent office developments has outrun the increase of transitfriendly office developments. In 1990, there were 6 auto-dependent office developments and 4 transit-friendly office developments. Through 1998, the total number of auto-dependent office developments increased to 46, while the number of transit-friendly office developments summed up to 12. NJ Transit and its partners are working with eleven towns in New Jersey to enhance areas around transit stations under this program. (2) They try to regenerate the vitality of downtowns and improve the quality of life of towns. This program can function as an antidote not only to the destructive impacts of the construction of large, isolated office developments on towns, but also to the possible damages of sprawl to our state. This indicator tells us how we are doing in a key area of New Jersey’s smart growth agenda. Regular updates are crucial if we are to understand whether we are achieving our smart growth goals. Figure 28.1 These data were developed for earlier editions of Living With the Future In Mind by the Vorhees Transportation Policy Institute, Bloustein School, Rutgers University, http://policy.rutgers.edu/tpi/. Updates are not available after 1998.